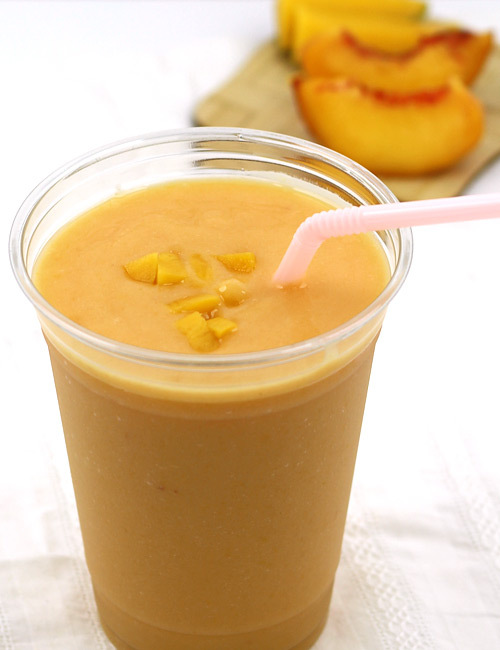 Peach mango smoothie prepared with this recipe is a lip smacking medley of ripe mango, fresh and juicy peach and vanilla yogurt. Make your summer weekends more enjoyable and pamper your taste buds with this refreshing and delicious low fat smoothie. 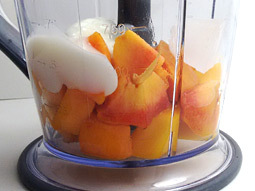 Place mango chunks, sliced peach, vanilla yogurt and crushed ice in a blender jar. Blend until smooth and creamy texture. Check the consistency of the drink. If required, add more fruit to thicken it and blend again. 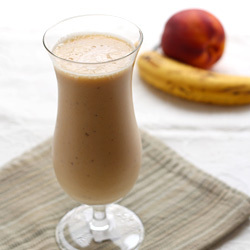 Pour prepared peach and mango smoothie into serving glasses and serve. 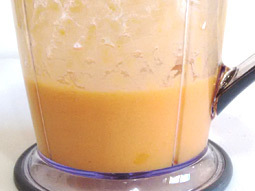 You can add peach nectar or orange juice to dilute the smoothie. Taste: Sweet taste of mango and juicy peach is simply heaven. The vanilla yogurt adds extra creaminess and smooth texture to this icy drink. Serving Ideas: Serve it as a cool evening beverage or as a dessert.